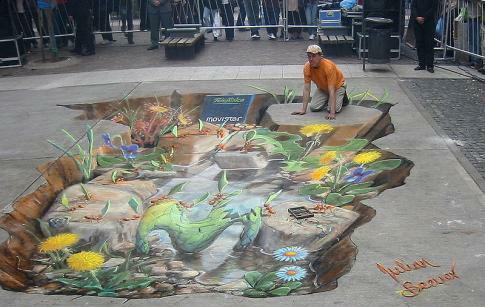 Street artist Julian Beever sits on a rock as part of his chalk drawing of a hole in the pavement filled with water and ants for a promotional campaign. this is the most beautiful drawing ever how someone could do this i do not know.I LOVE THIS WEBSITE!!! wowww!!!! that is amazingg haha.i wonder how they get it to look like that haha.?? ?